Vada's Blog Stamp Inks and Paper : GC. #101 Chestnut Theme Cowboy and Cowgirl Challenge. GC. #101 Chestnut Theme Cowboy and Cowgirl Challenge. I have two Cowboys here that would like to encourage you to join our challenge. Round up your “Wild West”, themed stamps, cowboy, cowgirl, hats, boots, guns and ropes etc, and come join us in some "Routin’ Tootin’ Fun"! For my card I’ve used the “Watercolor Distress TQ” from February 2007 Technique Junkie Newsletter for my background. Also the “Bandanna TQ”, from August 2008. Stamps credits are DRS Designs and embossing folder is from Cuttlebug, and the punch is from Martha Stewart. Thanks again for stopping in today. Great card! I love the hat! Love this card Vadda and the background is stunning! I love this card-the background is wonderful!! 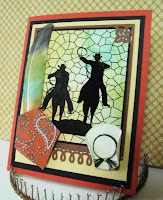 Great card, love the cowboys and the background is wonderful! This is a Routin Tootin fun card! Love this! Have a wonderful Mother's Day! Great card. I really love that background.